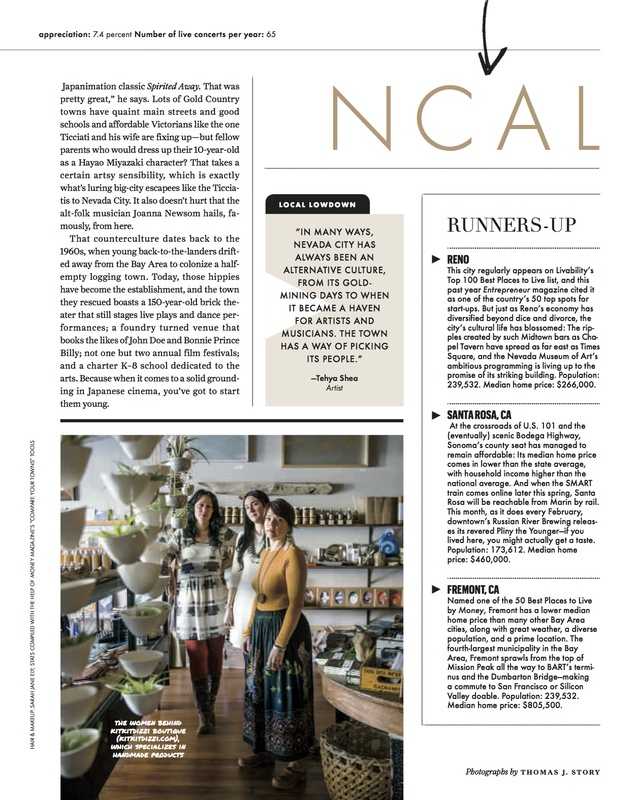 Nevada City has been named in a number of “best of” lists, including one in Outside magazine, as we’ve regularly reported (examples are here, here and here). 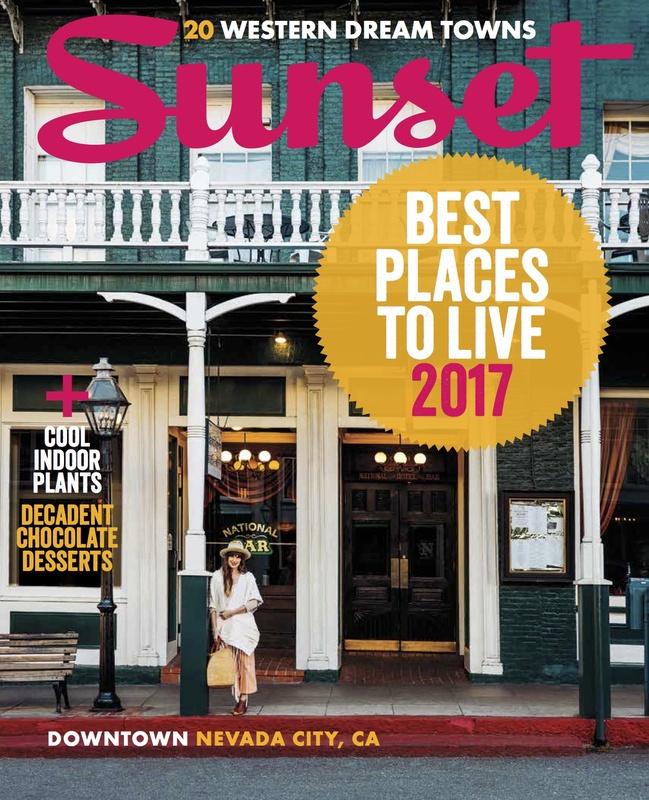 Now Sunset magazine has named Nevada City No. 1 on its 2017 “Best Value Towns” list. The February cover of Sunset also features Nevada City: local resident-artist Tehya Shea is standing in front of the National Hotel on Broad Street. It was part of a photo shoot of the town (which mentioned a few other businesses) by Sunset photographer Tom Story. “With housing costs rising, the great cities of the West — San Francisco, Denver, even L.A. — are creating an existential challenge,” it reads. 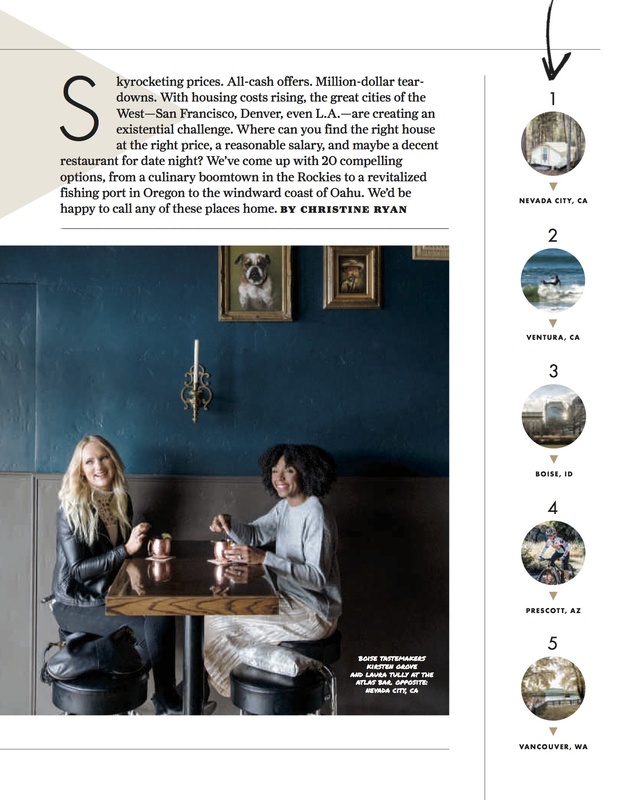 “We’ve come up with 20 compelling options … We’d be happy to call any of these places home.” Nevada City is listed #1 of the 20. Others, in order, include Ventura (#2), Boise (#3), Prescott, Az. (#4), and Vancouver, Wa. (#5). Runners-up for Northern California and Northern Nevada were Reno, Santa Rosa and Fremont. Sunset listed Nevada City’s population at 3,145; its median family income at $55,000; and its medium home price at $377,000. How was Nevada City chosen? How was Nevada City chosen to be #1 on the list? What is some of the criteria? How do you plan to publicize this list? The comments on Facebook — which are generating much discussion — are mixed. Many people are expressing pride and pointing to the increased visibility the coverage is bringing to local businesses. Others, however, are expressing concern that being ranked No. 1 on a “Best Value Towns” list will just add more pressure on housing costs. The lack of affordable housing for many residents continues to be a concern. I’m not too concerned that a cover on Sunset, a monthly magazine, will suddenly lead to an influx of newcomers that will destroy the local lifestyle. The way I see it we are an aging, declining population, with declining enrollment in our schools. We could use a little boost. “Nevada City has become an economically failed tourist town overrun by druggies, trimmers and growers. That POS boardwalk? well it has been the demise of a number of businesses, including Senum’s own failed taco joint.” Guess the right wing sluggos over at Todd’s joint don’t know how to read. No, this is way over their head! If you want to comment here, sign your real name and don’t use foul language. Thanks. Jon Smith please feel free to contact me if you would like to help collect actual data from Nevada City to either confirm/dis-confirm the assessment of “an economically failed tourist town.” I’m all about data in the land of opinions! Thanks. 530-205-5751. Lex, I think Jon Smith was quoting someone on Mr. Juvinall’s sewer of a blog. Lex- My quote was from an anon poster at Todd’s blog. I hold said poster in rather low esteem. He doesn’t know how to read nor see beyond his own right wing lenses. To make a statement such as he did in light of a glowing cover article in Sunset says it all. As a comment about what I have seen during past years of Wild and Scenic showings, that this is anything but an “economically failed tourist town’ as Juvinall’s blog might have some believe. There are “butts in every seat” at every eatery in Grass Valley or Nevada City during Wild and Scenic. Day and night. The town is filled with folks who look at this as a yearly destination— happily. The towns have been packed with “puffy jackets.” lol.